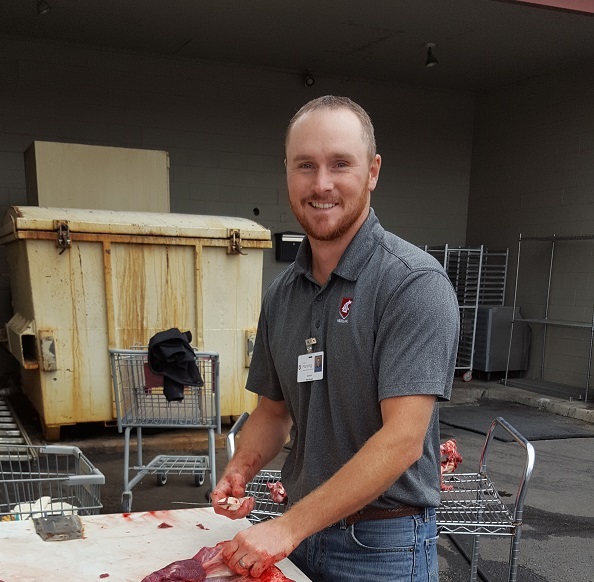 Mike Mosier, a senior WSU College of Nursing student, volunteered to butcher a road-kill deer and moose for the Union Gospel Mission in Spokane on Wednesday. Photo courtesy Union Gospel Mission. That’s how the senior nursing student ended up butchering a deer – and part of a moose – on Sept. 20. The game was road-kill, donated to the mission by the Washington Department of Fish & Wildlife, said Lynn Yount, spokeswoman for UGM. The mission is a regular recipient of such donations, but the person who regularly butchers game for UGM wasn’t available that day. Mosier said he’s butchered both deer and moose before. “I’ve been hunting since I was 7,” the Spokane Valley native explained. “I got the deer zipped up for them, then started on the moose. I got the two front shoulders done on the moose,” then had to leave for another clinical site, he said. Was he surprised to be doing that as part of his nursing education? Mosier graduates from nursing school in December, as does his wife Kelsey Mosier. The two received bachelor’s degrees from Eastern Washington University, then several years later returned to school to study nursing at Washington State University. “We both decided we want to do something to help people,” Mike Mosier said.